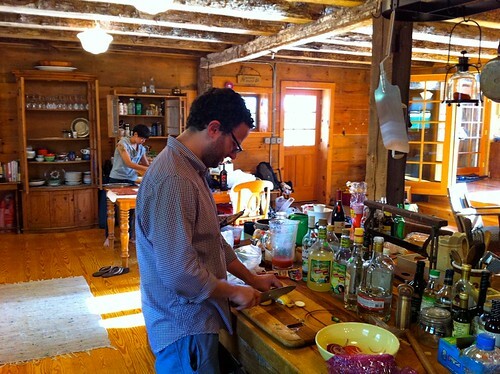 We were upstate last weekend, at our friend Cary’s barn (readers of my newsletter would’ve known that!) and Mark had done the food shopping. And while shopping, Mark had bought himself the ingredients to make guacamole. I began chopping a red onion while Mark tackled a lemon. At some point I asked where the garlic was. “Garlic?” Mark asked with a furrowed brow. 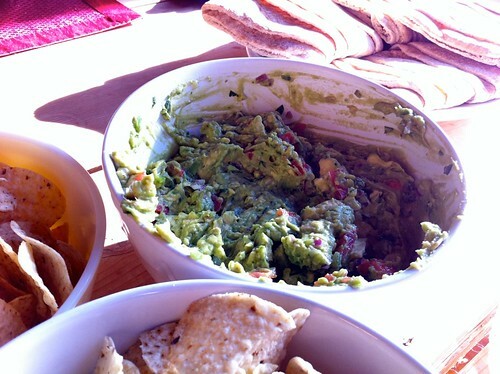 Turns out, authentic guacamole doesn’t have garlic. This is when Mark educated me on what goes into a proper guacamole (you should memorize this): avocados, lemon juice, red onion, a tomato, salt, pepper and two ingredients The Barefoot Contessa doesn’t have in her recipe but which Mark considers essential…. cilantro and a whole jalapeño. That’s really all there is to it. Mash with a fork (or, if you have a large marble mortar and pestle like I do now, it’s great in there too), taste for lemon juice and salt and serve. I’ve never seen a guacamole go faster. And this was so delicious that upon returning from upstate, I recreated Mark’s guacamole at home to serve on a hot, humid night with cold beer. The only additional tip I’ll offer is to buy Haas avocados that are starting to brown; those will be much softer (and easier to work with) than anything that’s bright green. So thank you, Mark, for educating me in the ways of authentic guacamole. Garlic, you are banished from my guacamole forevermore. Since writing this post, Mark has written me to address one of the more controversial elements of his recipe–the lemons instead limes. “I noticed some people were asking about lime vs. lemon, and you can really go either way. I prefer lemon just because I’m not crazy about the metallic quality of limes (so I even use lemon in margaritas, as does my favorite NM restaurant), but it’s a personal preference and limes are technically more traditional.” There you have it. 1. Slice your avocados in half vertically, circling your knife around the pit. Separate the two halves and then smack your knife into the hard pit (this is the best way to remove it.) Use a paper towel or a dish towel to yank it off your knife (it’s a good way to cut yourself, otherwise.) Use a spoon to cleanly scoop the avocado flesh into a large bowl. Repeat with the rest of the avocados. 2. Add the rest of the ingredients to the bowl and begin to mash it all together with a fork. 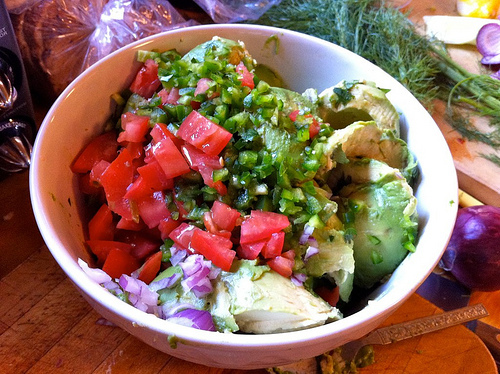 The most essential part is that you break down the avocados into a pulp, working the jalapeno, onion and cilantro into the mass as you do so. You’ll know your done when there are no hard bits of avocado remaining. 3. Taste and adjust for salt and lemon juice. When it’s delicious, sprinkle some more cilantro to garnish and serve with a big bag of sturdy, high-quality tortilla chips for scooping. Goes great with beer.